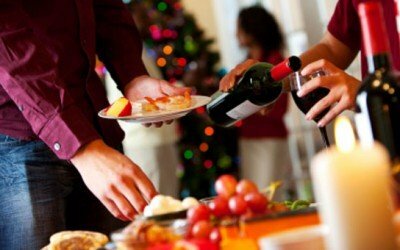 Are you mindfully aware of what and how much you eat during the holidays? It is easy to steer off the path of sound eating habits at this festive time of year. It is also just as easy to take responsibility for your nutritional approach. The following tips will help you take back control of your holiday eating behavior, while still enjoying this special time of year. • Understand what "mindful eating" is. This is the term dietitians and other health experts use to describe paying attention to what you put into your body. It means consciously taking notice of every single thing you eat and drink, no matter how small the quantity. • As Dr. Michelle May puts it, "Save the stuffing for the turkey." In other words, practice portion control. The problem with many children, teens and adults these days is we ate way too much at each serving. Don't overload your plate. Especially where treats and dessert are concerned, enjoy small portions. • Take time to enjoy your meal. Talk to those around you. Eat slowly, and let your body fill up naturally. Many times you over-consume during the holidays because you don't give yourself enough time to feel full. • Take smaller bites. Serve yourself on a saucer instead of a dinner plate. Choose a glass or beverage container that holds 12 ounces instead of 24 ounces. These seemingly insignificant steps can lead to a mindful awareness of just what and how much and what you are eating. • It may sound simple, but be aware of whether you are actually hungry or not. If you think you are hungry, it could be because of all the wonderful looking and smelling foods that surround you. Many times, you are experiencing false hunger signals. Try this the next time you feel like you may be hungry during a holiday celebration. Drink 12 to 16 ounces of water, move out of the site of any food and wait 10 minutes. If you are still hungry, go ahead and eat. • Put your utensils down between bites. If you are spearing another forkful of food while still chewing your current mouthful, you are already focusing on your next bite. • After filling your plate, walk away from the food supply. The problem with eating at a table that is filled with wonderfully delicious looking, smelling and tasting food is that you can just reach out and get more. • Have a conversation with yourself. Silently tell yourself that you can always eat more later. Remind yourself of your health and fitness goals. To be mindfully aware of your eating habits during the holidays, you must constantly talk to yourself about the experience.